Product information "Haibike SDURO Fullnine 7.0 black/gray/turquoise Men 2019"
The SDURO Fullnine is equipped with 29 inch wheels. These guarantee an agile handling in the terrain and on trails. Root passages are no longer a problem thanks to the 29-inch wheels. The 100 mm suspension fork and the 203 mm and 180 mm disc brakes provide the necessary safety. The damper increases the traction on root passages and thus simplifies the ride in difficult terrain. The exit is much more relaxed and the driving pleasure increases enormously! With the 11-speed gear you always have the right gear for every terrain. So you're not too steep! This is also ensured by the powerful Bosch Performance CX with 250 W. The 500Wh battery ensures that you can handle long trips without any problems. In addition, the E-MTB impresses visually, by the, in the down tube, built-in battery. Thus, the SDURO Fullnine is the perfect choice for longer off-road tours! Tire Schwalbe Smart Sam Performance, 65-622, 29 "x 2.6"
The engine is the technological core and the visual essence of an eBike. Thanks to the GravityCasting interface, we can rebuild the engine as close as possible and dispense with all separate retaining plates. This reduces the installation space to a minimum and reduces the optical volume of the engine to a fraction. As a protective component, the SkidPlate is not only sensible from a technical point of view, it also optically encloses the engine. This visually becomes part of the frame. The result is a technically perfectly tethered engine, which is not, as in its standard solution, a foreign component, but rather a natural center of the ePerformance bike. The Bosch engine presents two challenges to engineers when developing a high-performance chassis: its size and its extremely small drive pinion. Because actually the rear storage would have to be close to the contact point of the chain on the pinion. Due to the small size of the storage would thus run directly through the engine, which is of course impossible. Therefore, we have developed a simple but efficient concept: the Haibike Sprocket Equalizing System (S.E.S). First, we move the rear bearing upwards. On the one hand we achieve a correct wheel lift curve (the wheel moves away from the obstacle) and on the other hand the shortest possible wheelbase (because the bearing point is not between the engine and the rear wheel). In order to avoid the inevitable influence of the chassis on the chain during compression, we set a deflection roller directly axially on the rear bearing. In addition, we have integrated a chain guide on the pulley. Together with the guide on the Haibike Sprocket, chain dropping becomes almost impossible. The new InTube battery offers a high degree of integration, beauty and functionality and is available in many of our models. Our patented MRS makes it possible to attach various accessories quickly and easily to the bike. An attachment rail is integrated at the top of the down tube, in which, for example, a drinking bottle or bag can be mounted at a freely selectable position. Thus, you have all the utensils you need during a ride, always within reach. We use the FidLock Magnetic Fastening System, which provides secure hold and ease of use, and can be mounted on very small frames thanks to its minimalist design. With just a few simple steps, an additional battery (TheRangeExtender) can be installed, thus enabling a significantly longer range (only for hardtails with BOSCH Powertube). It is the heart of the frame: the engine interface. It combines many elementary important functions such as engine mount, swingarm and damper mounting as well as the positive connection of the battery and downtube. And the more stable the interface, the more stable the entire frame. Therefore, since 2010 we have been using a casting process from motorcycle construction, the so-called gravity casting process. Negative forms of pressed sand are stored in large molds, which are swiveled after pouring with an aluminum-zinc alloy into different, precisely calculated axes. Due to gravity, a uniform wall thickness of the casting is achieved. With the help of the method, extremely stable components can be produced, which are individually subjected to a complex X-ray inspection of the casting quality. A subsequent computer-controlled reworking allows a constant precision. 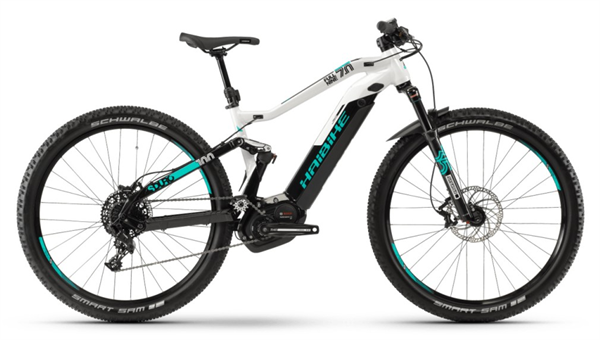 Related links to "Haibike SDURO Fullnine 7.0 black/gray/turquoise Men 2019"
Customer evaluation for "Haibike SDURO Fullnine 7.0 black/gray/turquoise Men 2019"